Standard Jewish deli fare focuses heavily on — what else? — meat. Brisket, pastrami, and smoked fish like lox and sable are standbys that Jewish food lovers can always count on. But as times change and people grow more and more health conscious, what is to become of these heavier, fatty delicacies? We’ve already seen the meat-free Impossible Burger popping up on menus everywhere, so it shouldn’t be surprising that other forms of meat are also going meatless. “As interest in all-things-vegan continues to grow, I am not at all surprised that more Jewish delis are trying to accommodate customers who are looking for healthier, plant-based alternatives. I know on our own website, our recipe for vegan lox gets more traffic than any other recipe,” says Cohan. Of course, the foundation was already there: A lot of typically Jewish seasonings that are plant-based and vegan are being used in really interesting ways in more mainstream cuisine. “Things like this everything bagel mix, za’atar, and harissa can add wonderful dimension to any dish,” says Kristin Eriko Posner of Nourish Co, a lifestyle company that is anchored in the fusion of Jewish and Japanese cultures. Religious experts will also tell you that there’s a biblical reason people may consider making the switch. “There are also ethical considerations, as the production of meat products almost always involve egregious violations of the Torah,” says Cohan. Whether it’s for religious reasons, health reasons, or something else altogether, many established well-known Jewish delis have been going in a whole new direction. “Solomon’s Delicatessen (in Sacramento) has undergone the Eat REAL® Certified Audit, becoming the first REAL Certified Jewish Deli in the nation,” says their executive chef, Aimal Formoli. “Our nostalgic classics, prepared with a farm-driven California twist, are the result of detailed sourcing and original recipes utilizing clean and healthy ingredients,” he adds. And it seems their customers are happy. “The response to our vegan and vegetarian menu items and our modern take on classic Jewish delicatessen fare has been tremendous and we are working to add new and seasonal options to our menu,” says Formoli. Other delis around the country offering vegetarian versions of deli classics include Mamaleh’s in Boston, General Muir in Atlanta, and Zingerman’s in Ann Arbor, Michigan. 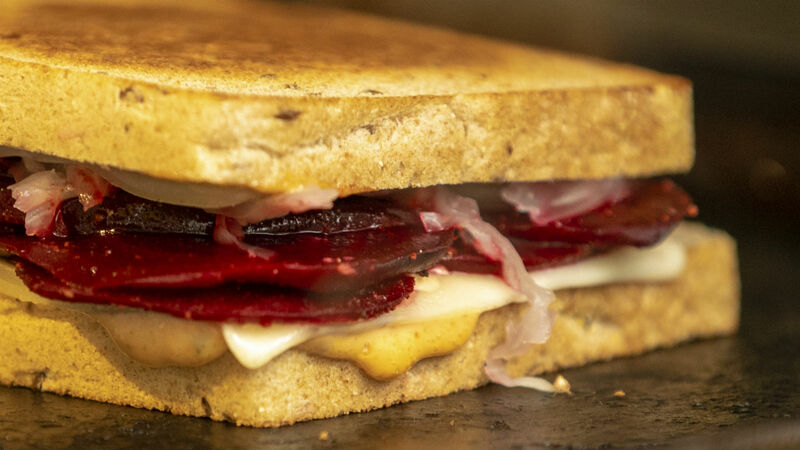 They’re all offering vegetarian takes on the classic Reuben sandwich using ingredients like mushrooms, tempeh, and even smoked beets in place of pastrami.